Specializing in custom frameless shower doors & more! Family owned & operated. With over 15 years experience in measuring, designing, & installing Frameless Shower Doors, JV Shower Doors & More GUARANTEES a beautiful finished product. We are perfectionists and will not leave a job unless it is up to our very high standards. Give us a call so we can come out and do a FREE estimate, draw out & design your shower to show you that we can give you exactly what you are looking for at a great price! Our reviews speak for themselves, 100% satisfaction guaranteed! Quality service done fast. Super helpful folks and true to their word. Highly recommend! Quality materials, great installation, service and follow up unmatched! Great service and great quality all across the board. Thank you for making this so painless! Great customer service. Always on time and the product is fantastic. Awesome! Customer service was awesome! Installation was wonderful! Just a great experience. Excellent and professional service, guys did a wonderful job! Let me start by saying this is by far the Best Small business we have had the pleasure of working with! From my initial visit to the small and cozy showroom, I was not Overwhelmed with way too many choices. The showroom was simple and to the point. The salesman was very nice, he listened and assured me someone would contact me for an appointment. Vanessa and Josh were great to work with and gave us an estimate that was almost 1/2 of what another business quoted us! The 2 gentlemen that came to the house for the install, exhibited their superior knowledge and answered every single question we had. They represented the company well and even managed to get some more business from us in the process!😊 JV Shower Doors will be removing and installing new mirrors in both our bathrooms! If you want Superior Workmanship from an Honest and reliable company that won't break the Bank, then look no further! Great service from beginning to end. Satisfaction guaranteed. Would recommend to anyone seeking high quality and personalized service. Thank you JV Shower Doors. I must confess that the upgrade to an all glass shower door/enclosure was my wife's idea and was really not high on my priority list. Having said that, I could not be more pleased with the final result! The door looks terrific and is a really nice enhancement to our master bath. JV Shower Doors and More provided an outstanding product and a smooth, hassle free installation. Highly recommended! Great company! We got three quotes for a new glass shower door and they were the most affordable. We were still on the fence if we should use them, and then my husband and I visited their showroom and met with Vanessa. She was was wonderful! She showed us what we would be getting, answered our questions, and we even went for upgraded hardware and it looks beautiful. The glass came in in about a week. The installers were nice and professional. Also they use a local vendor...the glass is made right here in Orlando. Thank you! I had to deal with this company mainly over the phone as I was out of state for a little bit where I needed their service. Vanessa was fantastic to deal with over the phone and they kept communication up with me as well. Guys met with my son at the house for measurement and were great in telling us all the details and some things that would need some adaption or change. Install time was within the next week and they show up when they tell you. I would definitely recommend this company as they are great to work with and have great service. I would use them again if needed. Don’t even bother going anywhere else. JV Shower Doors is the best in the area. From the attention to detail that Josh took during measurements to the scheduling from Vanessa to the detail from the installers it was a great experience. The final product wow’s everyone that sees it, and is truly worth every penny. Go with JV Shower Doors because they are the EXPERTS in shower doors. My wife and I scoured the internet for frameless shower door contractors and came across JV Shower Doors and could not be happier. From start to finish, this company is the epitome of professionalism. Every step is explained thoroughly, the installers arrived in a timely manner and were friendly and professional. Most importantly, the job was done right! I could not recommend this company enough. I am remodeling another bathroom in my house and will look no further than JV. One word AMAZING!! So please with our frameless shower door, almost a shame the house is being sold and we won't be able to use it. 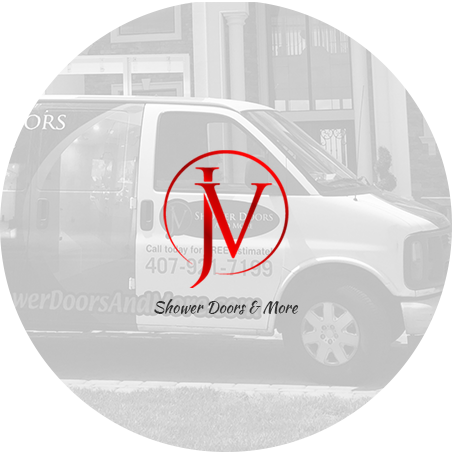 If you are looking for quality and excellent workmanship then JV Shower Doors & More are the one for you. I am very happy with the timely manner everything was handled from consultation to installation. Perfect, start to finish. 😉 Thank you, my master bath looks Superb! Thank you Vanessa and Josh !! Our shower doors at our beach house look amazing !! From our first call to the installation your service and product has exceeded expectations. It was such a pleasure doing business with you. You both made everything so easy, relaxed, and wonderful. We’ve got 2 more bathrooms we’ll be calling you again for!! Everything about this experience was excellent. Vanessa in the showroom was helpful and offered many suggestions to get exactly what I wanted. Josh was timely and professional coming out to do the measurements, and the installation team exceeded my expectations. My master bath looks so much better after upgrading cheap builder shower doors with frameless. Josh came out in a timely manner for the estimate and measure. All parts came in and were installed in under two weeks resulting in a fantastic finished project. The installers were very professional and diligent. Amazing customer service and so professional!Excellent job and would recommend to anyone needing beautiful glass shower doors!!! I recommend JV Shower Doors without hesitation. I had a wonderful experience with them from beginning to end. They have a high quality product, at a fair price, and offer exceptional customer service - I requested that they complete the job in a short period of time to be able to host people over Thanksgiving week, which they did and exceeded my expectations! Amazing!! These people understand what customers are looking for from their quality products to their excellent customer service. The entire project I felt as if I was their priority and that my project was the most important piece of business they had. Thank you for such great attention and for finishing my bathroom with perfection! We could not be happier with our beautiful shower enclosure and the professionalism of JV Shower Doors. Highly recommend!! Joshua and his team were wonderful to work with during our master bath remodel! He was prompt, professional, and did a stellar job enclosing our walk-in shower. His work put the finishing touches on our remodel and we couldn't be more pleased with his work! I highly recommend him and his pleasant staff! These guys are great! They were not only well priced, they were extremely nice and you could tell they knew what they were doing. They made it look even better than I imagined by going the extra mile on a couple of things. Our bathroom was new and messed up by the contractor, the shower was leaking due to bad tiling under the glass. They came out (at no fee) and installed a small part which fixed the problem. We met with a lot of glass companies before choosing these guys, and Im glad we didn't go with anyone else.